King Toronto Condos will occupy almost an entire block on King Street West between Portland Street and Spadina Avenue. 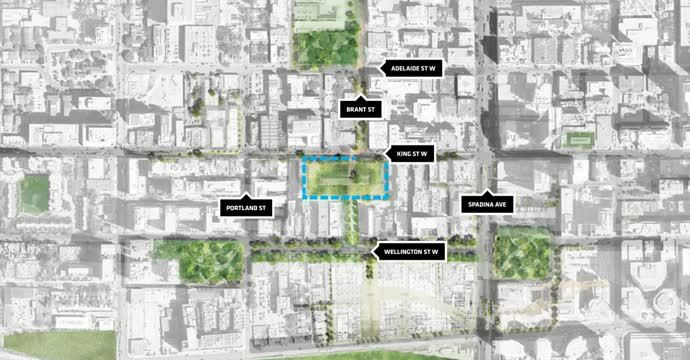 Fronting 189 metres from 489 to 539 King St, the site includes heritage properties at 511 through 529. Meanwhile, the contemporary forms surrounding welcome pedestrians into the courtyard while deferring a measure of aesthetic prominence to the site's historic buildings. Rising to a maximum height of 16 storeys, 500 residential units with protrude window boxes surround a large interior courtyard, designed to invite both residents and passerby into a more intimate communal environment. The innovative design and the heritage buildings complements each other, creating four sculpted peaks and valleys. King Toronto will offer over 180,000sf of Retail and 60,000sf of Office/Worksapce. It will be a diverse and lively zone for living and shopping with new retail, hospitality, workspace and cultural offerings. This year-round destination will feature restaurants, cafes, one-of-a-kind shops and services, street celebrations and craft & farmers markets. At any given time, the team is involved in projects at every scale, from the micro to the macro level. We are involved in multiple public art commissions, with nearly 30 installations by some of the world’s most accomplished artists either complete or underway. We are conducting our piano program with Fazioli, building a collection of instruments that exemplify the integration of art and architecture. Since 1990's, Allied’s commitment to historical preservation and adaptation went against the grain, defying the conventional wisdom that “new” was best. It wasn’t an easy journey—it took an uncompromising belief in the work that we do. In bringing this vision to life, we have helped shape the creative, innovative communities that drive change globally. Today, Allied continues to transform the workspace of the future, applying the principles of traditional brick-and-beam architecture—high ceilings, exposed brick, hardwood floors, open concepts, ample natural light—to ambitious large-scale new developments built to anticipate the evolving needs of future innovators and leaders.